Cassiopeia: Shimmering, darkened, dirty gunmetal in a black gelée base. The mood: Dark futurism. The city after midnight, with pulsing cycles of light glimpsed through thick smoke. Dark Constellations: We have gazed into the stars to conjure six dark and mesmerizingly iridescent shades of Celestial Sphere Eye Soot, each evocative of the deep cosmos. Every color suspends color-shifting, sparkling mineral pigment in a translucent black gelèe for dramatic, shadowy yet glimmering applications. I love this stuff! I like to use it for a subtle shine in the corners of my eyes or all over my lids for a more dramatic look! It is easy to apply and lasts all day. Plus I love the smell of the product and the beautiful packaging! I am so happy I got to snag this magic while it was in stock! Perfect metallic color that you can use in so many ways. Depending on how much you use it can be mystical or edgy. Love love move!!!! This color is pure magic. I love it so much. 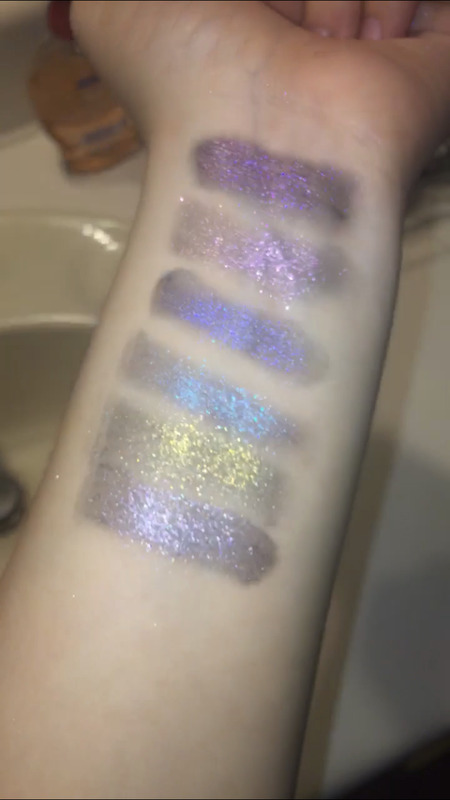 The texture is so creamy and it's the perfect amount of glitter. I can use just a little bit for a hint of shimmer for day or build it up for some nighttime drama. A little goes a long way. I love that this can go from a subtle dove grey to a smokey almost black pigment. I bought all six of the limited edition shades—and I’m so glad I did. They’re absolutely gorgeous, and so versatile, just like everything else from Rituel de Fille. The way they catch the light is bewitching. I can’t seem to look away!